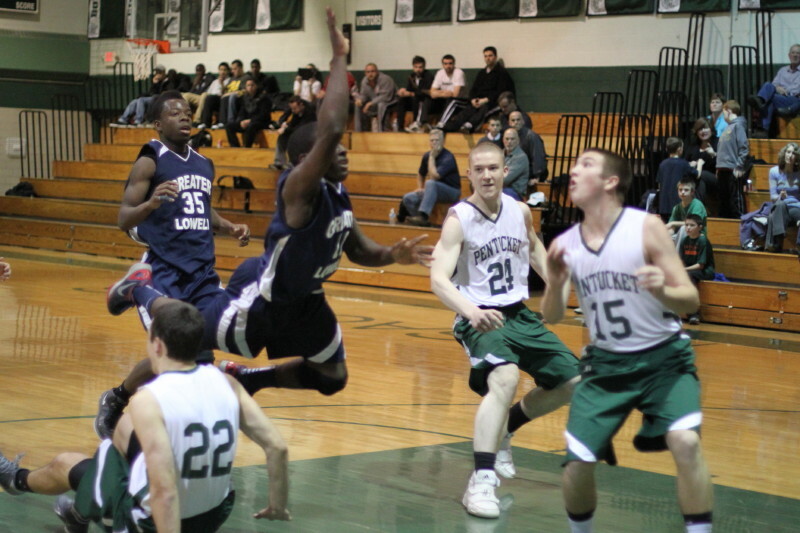 Gbah Dualu gets caught in a triple-team in the closing seconds of the game. 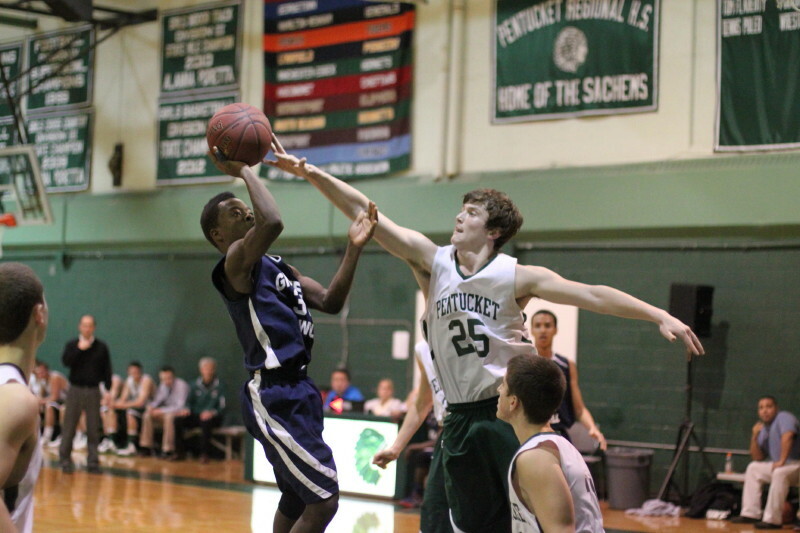 (West Newbury) The Pentucket Sachems came out on the right end of a back-and-forth final quarter and defeated Greater Lowell Tech, 58-57, on Thursday night in non-league boys action. There were seven lead changes in the exciting fourth quarter. The visiting Gryphons (4-6) had two possessions in the final minute to respond to Mike Aiduk’s layup (assist to Jake Bordeianu) that put the Sachems (3-7) in front, 58-57. On the first possession, Gbah Dualu (22 points) settled for an outside shot (which he missed) . On the second possession, the speedster was cornered by three Pentucket defenders and forced a shot that drew air as the game ended. 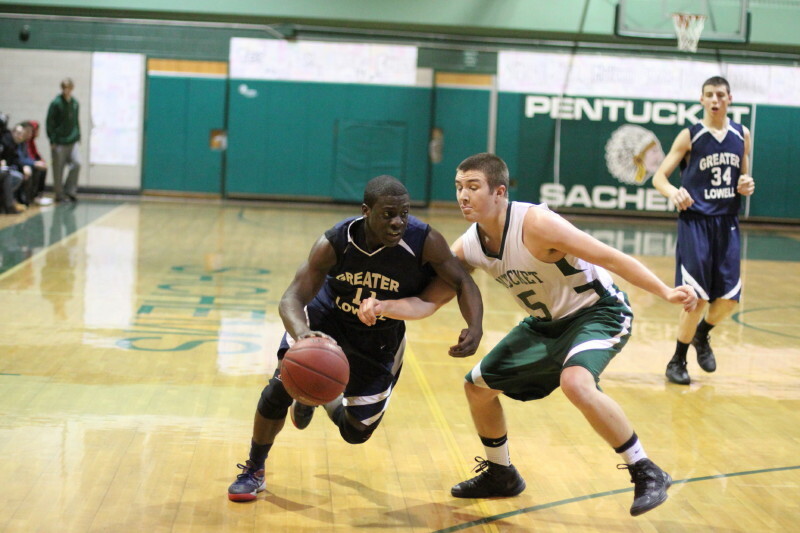 Pentucket started fast against the GLT man-to-man defense running ten straight points to get up 12-2 after 3 ½ minutes. Once the team from Tyngsboro shifted into an active zone things went much better for them. The Gryphons closed to 12-9 in the first quarter and stay close (22-19) in the second quarter. 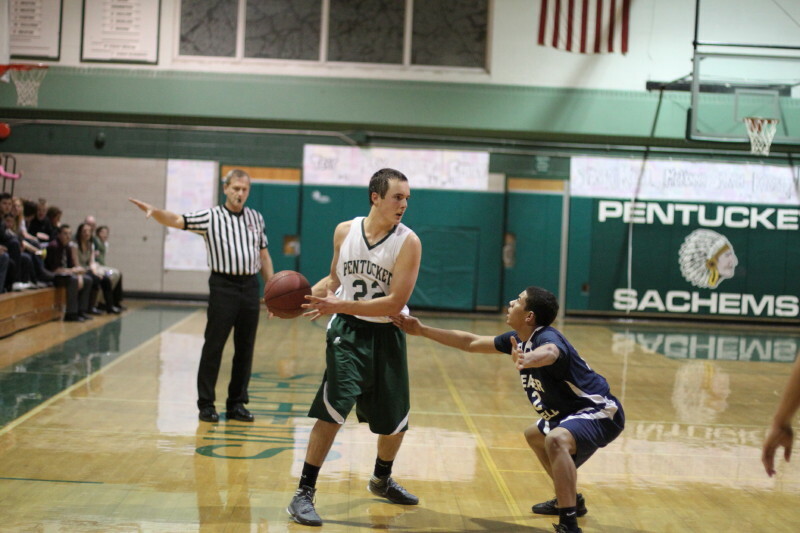 The Sachem lead was 27-22 at the half. 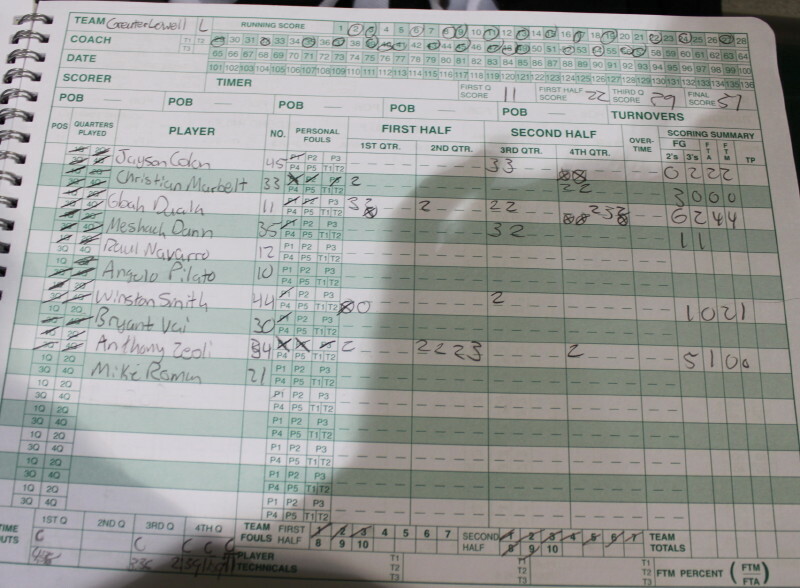 Ryan Kuchar (19 points) had seven in the first quarter. Anthony Zeoli (13 points) had nine in the second quarter including a three from the right corner that went in off the backboard. 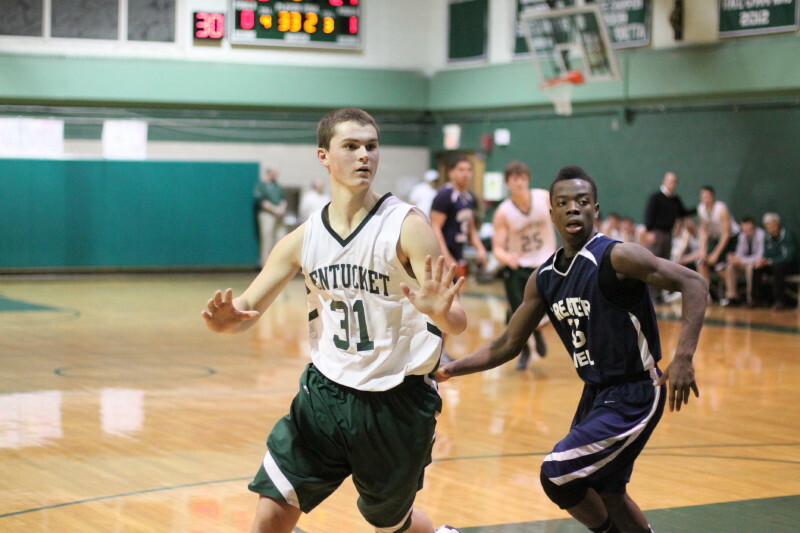 Pentucket would build their lead up to 36-27 in the third after a layup and a three by junior Ryan Kuchar. However, that nine-point lead evaporated over the next 1 ½ minutes as freshman Mechach Dunn drove the lane and Jayson Colon followed with two straight 3’s. Suddenly the Gryphons were within one (36-35) and just as suddenly Sachem coach Ed Hickey called a timeout as he surely wondered why Jayson was completely unguarded on his second 3-point attempt. Greater Lowell finally took its first lead of the game (39-38) as Winston Smith’s converted rebound ended the scoring in the third quarter. As I said earlier, there were seven lead changes in the last quarter. 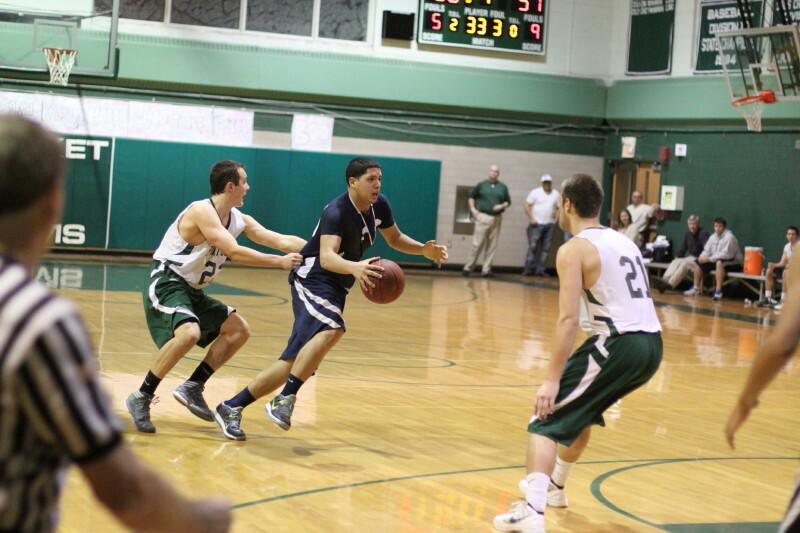 The Gryphons got up by as many as three (45-42) and the Sachems led by as many as five (56-51). Pentucket took that five-point lead on Calvin Wiles (13 points) long one with 1:15 left in the game but in less than ten seconds Gbah Dualu answered with a three for GLT to cut the lead to two. Mike Aiduk (10 points) tallied what turned out to be the winning basket with fifty seconds left before Gbah drove the length of the court for a layup and a free throw. 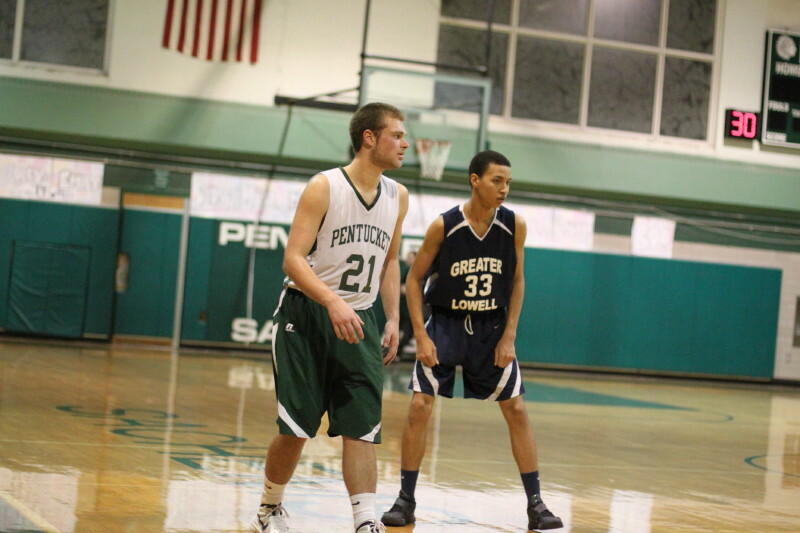 So the last forty-five seconds were played with Pentucket clinging to a one-point advantage. Somehow the Sachems went home with the win despite two turnovers and a front end of a one-and-one miss by Ryan Kuchar. The Gryphons had two possessions to tie or win the game. I was very surprised when Gbah settled for a jump shot on the first one. 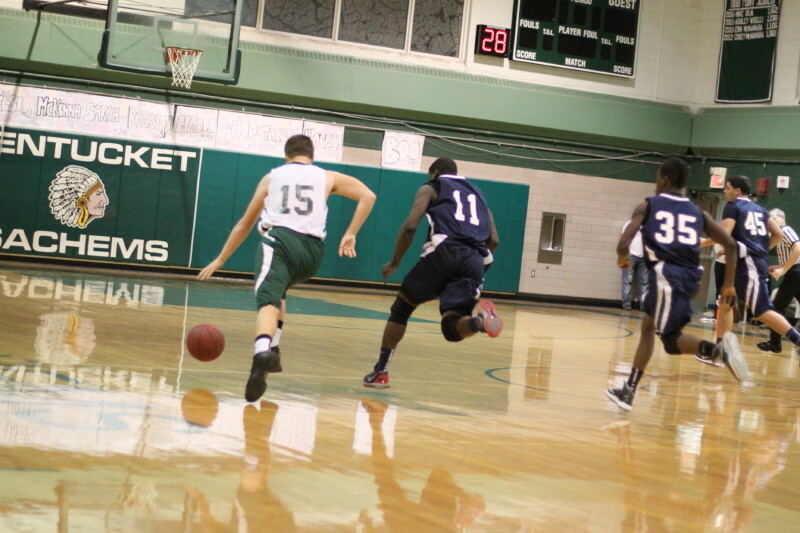 He had the speed and strength to get to the rim and had done it several times during the game. The second possession, with eleven seconds left, was undone by an Ed Hickey coaching decision to foul since his team had one to waste. Jayson Colon ended up dribbling away almost eight seconds before Mike Aiduk fouled him. 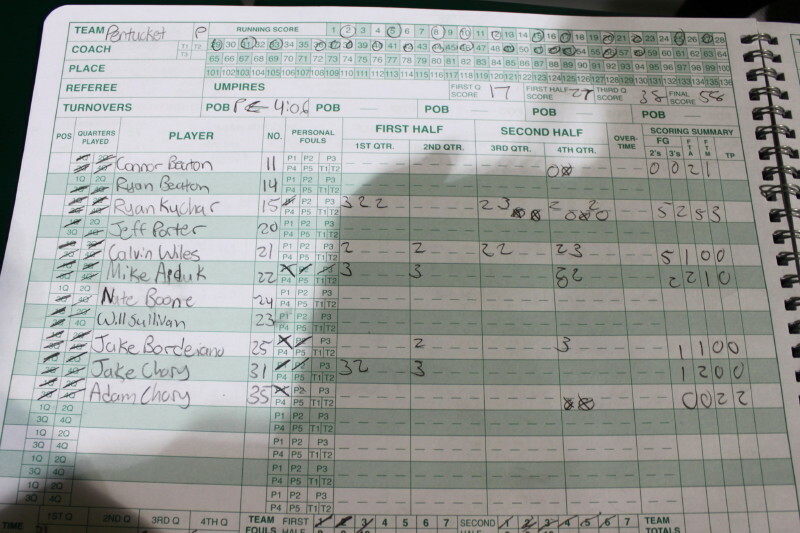 Greater Lowell now had only 4.9 seconds to do something from half court. 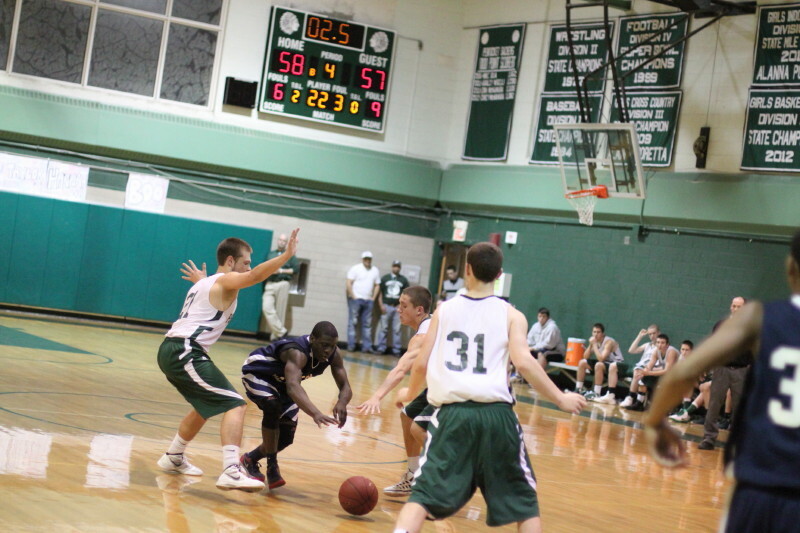 Gbah took the inbounds pass and was triple-teamed by the Sachems. This excellent defense left him with no openings and no time. He had to fire quickly and the shot wasn’t close. Greater Lowell is in the Commonwealth Athletic Conference and is in Division 3 as our the Sachems. There is only one senior (Christian Marbelt) on the team. Their next game is at North Shore/Essex on January 22nd. The Sachems will host Manchester-Essex tomorrow (Friday). 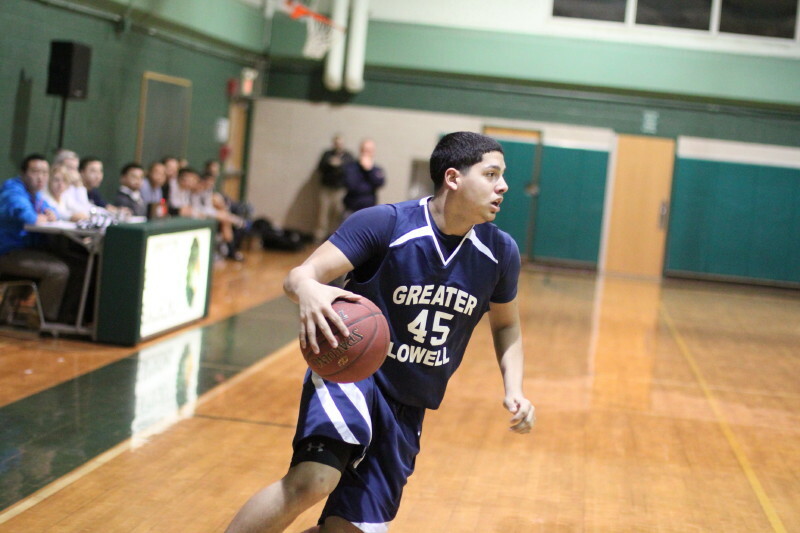 Greater Lowell defeated Chelsea, 56-54, on January 15th. A gryphon is a legendary creature with the head, talons, and wings of an eagle and the body of a lion.